The Airbus E-Fan, an all-electric trainer aircraft made of composite material, made its first flight last month–proving once again that it is possible to fly without jet fuel. That’s with one caveat however: The plane can fly for about an hour on a single charge. But still, this seems like a big deal mainly because the largest aerospace and defense company in Europe and the world’s leading commercial aircraft manufacturer is backing it. 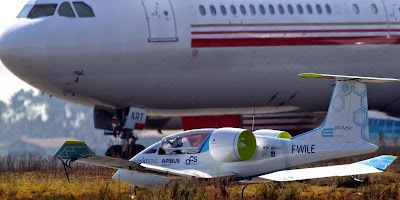 The successful first public flight of the electric E-Fan experimental aircraft was the highlight of Airbus Group’s E-Aircraft Day in Bordeaux, France on April 25. The electric E-Fan training aircraft is an experimental demonstrator based on an all-composite construction. Airbus Group and its partners intend to perform research and development to construct a series version of the E-Fan and propose an industrial plan for a production facility close to Bordeaux Airport. In addition, the group’s research efforts support the environmental protection goals of the European Commission, as outlined in its Flightpath 2050 program. Built with an all-composite construction, the E-Fan is 22 feet long and has a wingspan of 31 feet. It looks like a toy version of a jet aircraft with a pair of nacelles that aren’t really jets, but two ducted, variable pitch fans spun by two electric motors with a combined power of 60 kW. The ducting increases the thrust while reducing noise, and by centrally mounting them, the fans provide better control. The E-Fan flies at only 114 miles per hour. Powering the fans are a series of 250-volt, lithium-ion polymer batteries made by Kokam of South Korea. These batteries are mounted in the inboard section of the wings and carry enough charge for up to one hour of flight. They can be recharged in one hour. Worried about the “recharge” light coming on while up in the air? There’s a backup battery for emergency landings. Another key technology on the E-Fan is its e-FADEC energy management system, which automatically handles the electrical systems. According to Airbus, this simplifies system controls and, since E-Fan is a trainer, eases the workload of instructors and students. “It will not only lead to a further reduction in aircraft emissions and noise to support our environmental goals but will also lead to more economic and efficient aircraft technology in the long run. Our focus is to develop innovations that will help define what tomorrow’s aerospace industry will look like,” said Airbus Group Chief Technical Officer Jean Botti. So today the E-Fan is a learning platform, tomorrow a larger hybrid version that can fly 80 passengers on short regional trips. That’s apparently the plan. From small beginnings, a revolution in the air.